The Claddagh Ring is possibly one of the most culturally significant pieces of jewelry found anywhere in the world. 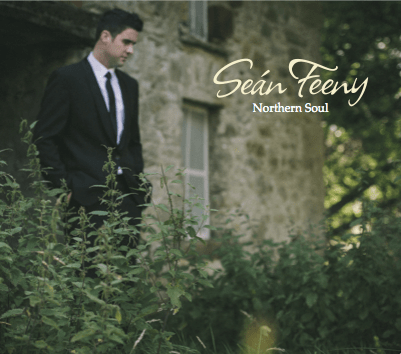 It’s history, design, meaning and manner of wearing are all deeply rooted in Irish tradition. Two hands of friendship hold a heart of love beneath a crown of loyalty. Love is in the air with Valentine’s Day fast approaching. 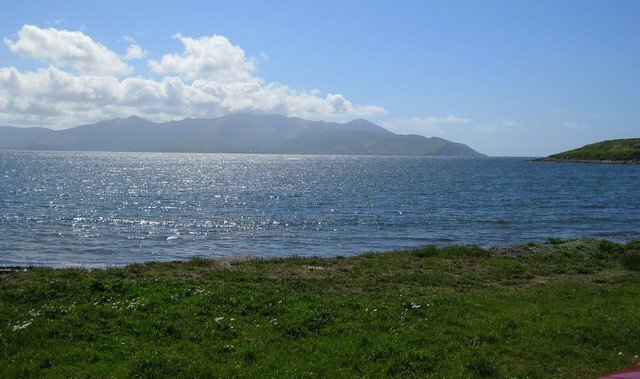 What better time could there be to further explore this enduring symbol of Irish love? The ring is named after a tiny fishing village called The Claddagh, which lay just outside the city of Galway in olden times. Today it is part of the city. This village got its name from the Irish word for stoney beach – “An Cladach”. 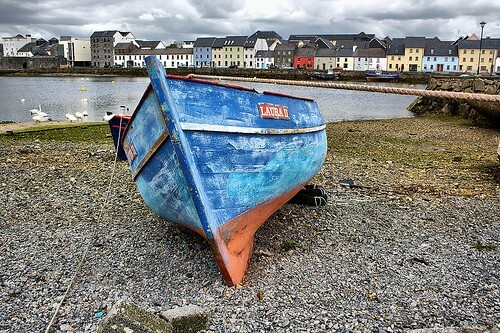 One of the oldest fishing villages in Ireland, it dates back to the 5th century. The people elected their own King, and lived by their own customs and laws separate from the people of Galway. It was an Irish speaking, thatch cottage community, that seldom welcomed strangers. There are three different legends told to explain the origins of the ring. Who knows which one first found life in reality! Today all three tales have attained mythical status. The first story centers around a Galwayman, Richard Joyce and his enduring love for his sweetheart Margaret. Richard was captured by Algerian pirates and sold as a slave to a Moorish goldsmith. Richard became his master’s apprentice and designed the ring, hoping someday to be reunited with his Claddagh love. In 1689 William III demanded the release of all British subjects held as slaves. The Moorish goldsmith offered half his fortune and his daughter’s hand in marriage if the talented Richard would remain with them. Richard declined, returning once again to Ireland in search of Margaret. She had remained loyal to him, never marrying another. They were reunited and wed. Richard presented her with his specially designed ring to symbolize their friendship, love and loyalty. The second historical theory centers around another member of the Joyce family. Margaret Joyce married a Spanish merchant who traded with the people of Galway. When he died and left her his fortune she returned home from Spain. She married the Mayor of Galway, Oliver Og French. She spent her fortune building bridges around Galway. 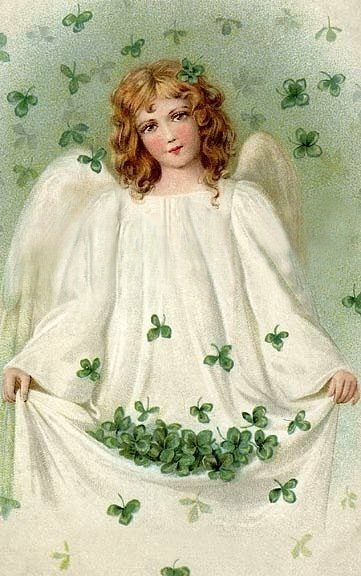 The first Claddagh ring was supposedly dropped by an eagle into her lap, as a reward for her generosity. 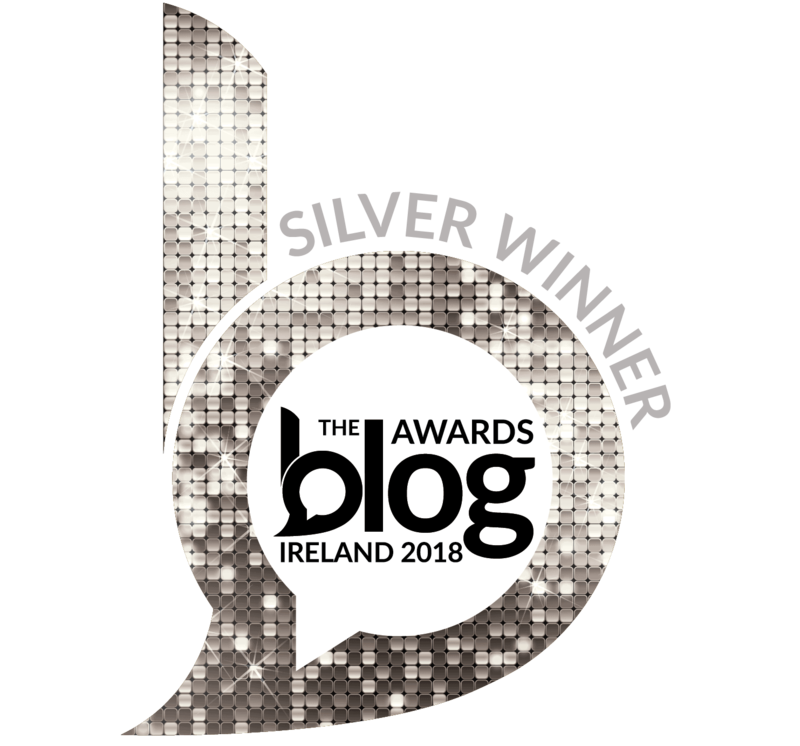 The third and final theory tells the tale of a Spanish prince who fell in love with a young girl from the Claddagh village after the Spanish Armada went adrift off the coast of Ireland in 1588. 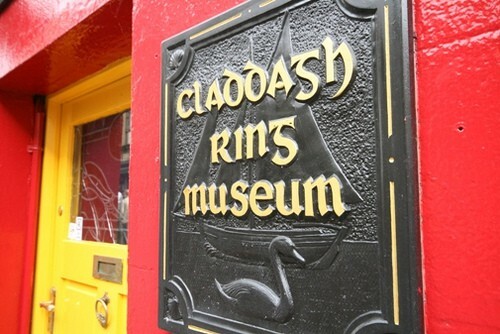 The people of the Claddagh hid the Spanish sailors from the English. The girl’s father did not trust this royal prince, believing his attention and intentions towards his daughter to be dishonorable. 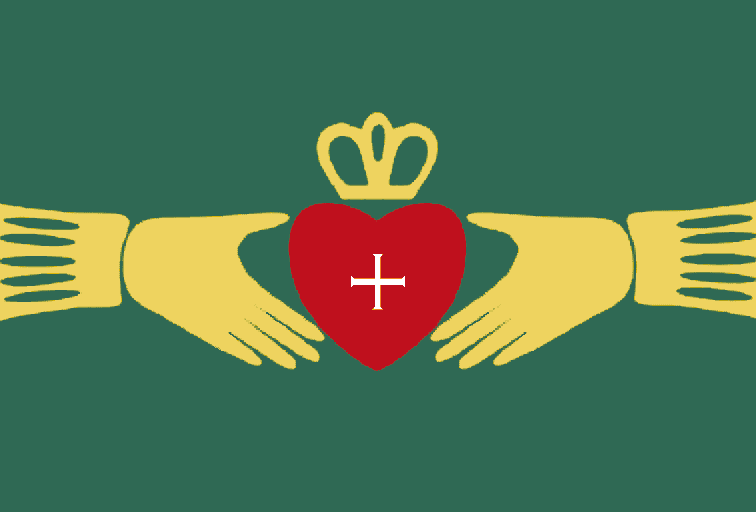 To convince her father of his love and loyalty, the prince designed the Claddagh ring. Her father gave his blessing upon hearing the deep significance and symbolism of the ring. These “fede rings” date back to Roman times. Let Love And Friendship Reign Forever! 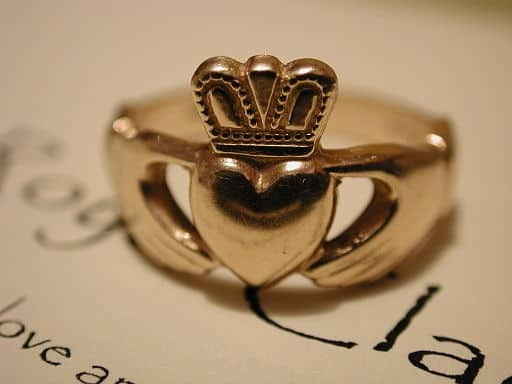 The manner in which a Claddagh ring is worn also holds deep significance. If a person is engaged or married the ring should be worn on the left ring finger with the heart pointing inwards towards the wearer’s own heart. If a person is interested in finding love, the ring should be worn on the right hand with the heart pointing out. If unattached, but disinterested in attracting the attentions of a potential suitor, the ring should be worn on the right hand with the heart pointing in. Today Claddagh ring designs use many different types of metals with gemstones often being seated in the middle of the heart. Wedding bands, embellished with the Claddagh design, encompass the tradition and romance of its deep rooted history. This enduring symbol of love and fidelity has been in existence for over 300 years. It’s significance has spread far beyond the Claddagh village where it originated. 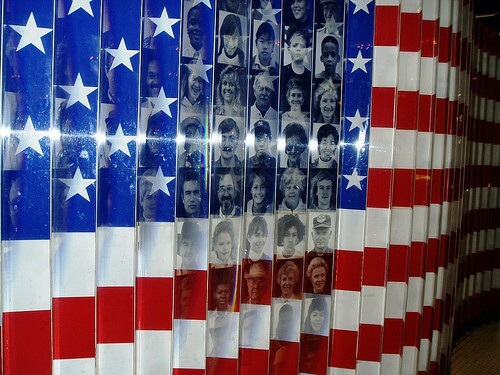 These rings of friendship, faith, love and loyalty are admired throughout the world today. 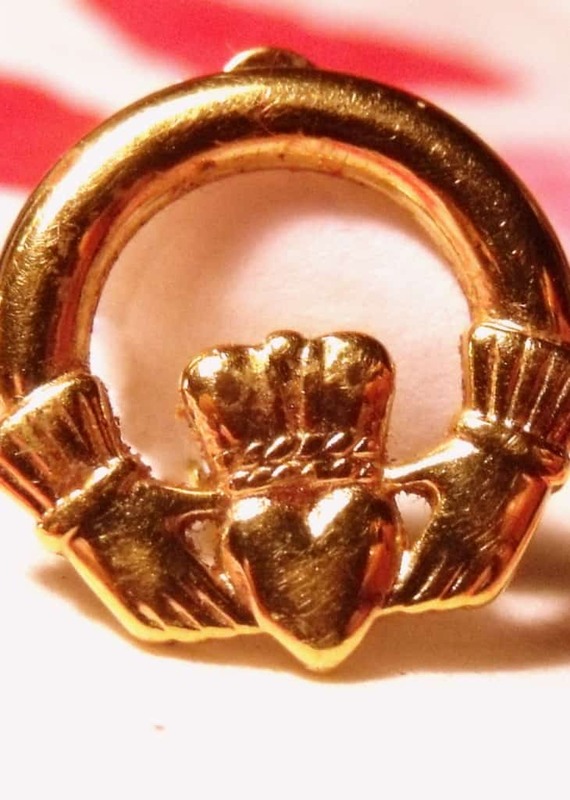 Hi Mairead – I’ve always had a soft spot for the Claddagh ring as has my wife. So much so, that her wedding ring is one that we got made and sent over from Galway a number of years ago. Of course I always knew it was a symbol of love but I never knew there was so many theories behind it’s origins. Liam – It’s lovely to hear that your wife’s wedding ring bears the Claddagh design. Growing up I always heard the story of the Spanish prince and the Claddagh fisherman’s daughter as an explanation for its origins. But who knows, there may have been ring dropping eagles flying around Ireland back then. Thanks for stopping by! Grammy – It always amazes me how many people worldwide cherish their Claddagh rings and wear them with pride. I don’t have a ring, just earrings, or I should say earring. My little girl took a shine to them and now one is gone missing. Someday it will show up under a bed or in an air conditioning vent or who knows where. Fingers crossed. If not, I’ll just have to get myself a ring. 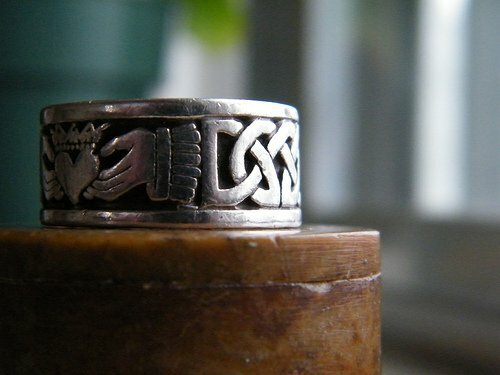 I too have always loved the design of the claddagh ring – a symbol Ireland is very proud of. I hope you always treasure your ring, Jenn. I like the Richard Joyce story myself, which one do you think is the correct one? Kay – Growing up in Ireland I mostly heard the story of the Spanish prince, but the story of Richard Joyce is so romantic, I like it best. I think we can rule out the story of the eagle dropping the ring from the sky, unless of course he stole it from Richard Joyce. Thank you for including my photo (the last one) in your post! Sadly, I’ve since lost the ring. Never to be found again. But I’ll be visiting my friend Jason soon to get a new one. The ring and its story have been a loving tradition amongst me and my siblings for many years. Thanks again for your post. Dylan – Such a beautiful ring and photo – thank you so much for sharing your image. So sorry you lost your treasured ring, but hope you get a replacement soon. 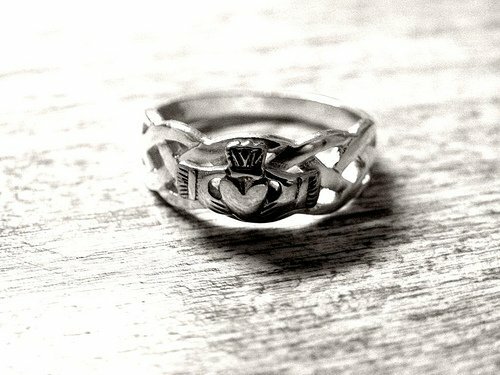 I just love Claddagh rings and the wonderful story behind them.